Create a new file (optionally with a filename and -extension) in the current Finder window. Select a Finder window (selecting Desktop is also possible). 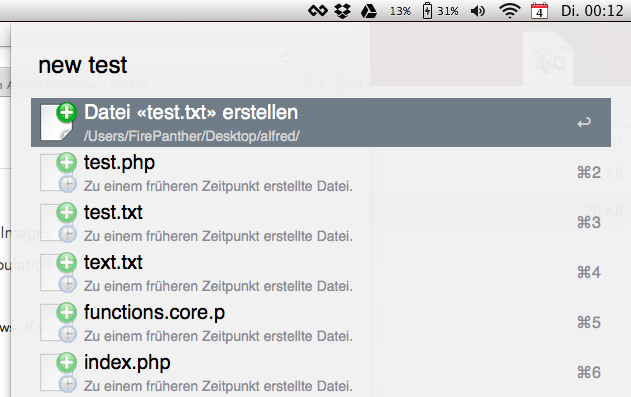 Open your AlfredApp and write "new" or "new filename.txt" and the file will be created. You can abstain the filename or the extension and the file will be created with the name "untitled.txt". It's also possible to write "new php" to create a file named "untitled.php". Create a file named "-.txt" (or another extension) in the "template" folder to set default content for all newly created files with this extension. This workflow remembers your inputs and shows your history when you create a new file. The history is sorted by your current input (if you're writing "ind", the history files "index.php" and "index.html" will appear at the beginning).